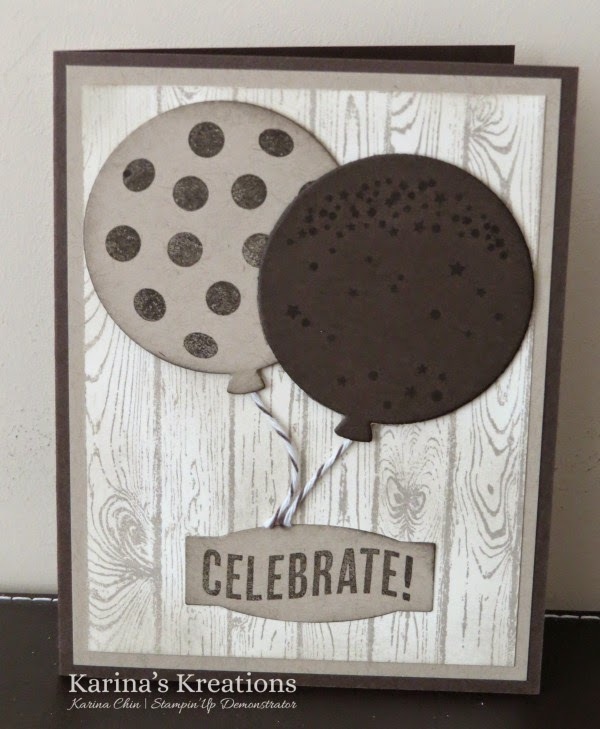 Karina's Kreations: Celebrate Today Birthday Card! My post is a little late today because I was prepping for my Birthday Card Bash Extravaganza tomorrow from 1:00-5:00. I cut two extra kits if you want to stamp. Just email me at kchin2@telus.net. This is one of the cards we're making tomorrow. It's a case of a card made by Dawn Griffith. It's a perfect masculine card for any age. I'm so excited about this set because it has matching framelits to cut out the birthday balloons!!! Even better, you can buy the stamp set and framelits as a bundle and save 15% off. In Canada, the price is 44.95. Add some paper to it to bring your order to $60.00 and get a Sale-a-bration item for free! Sale-a-bration only lasts until March 31 so don't miss out.